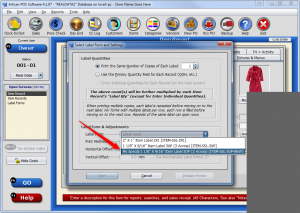 In order to customize labels, you need to use the Label Designer. The best way to start a label is to customize a built-in one. To make sure that you always have a clean base label to go back to, the label forms are Read Only and are protected from editing. To copy an existing label, highligh the form you want to clone and press Alt-F3, just like you would copy an item record. Of course you can start from scratch, but this is much harder. We strongly recommend copying an existing layout. Here are the label sizes that are available. 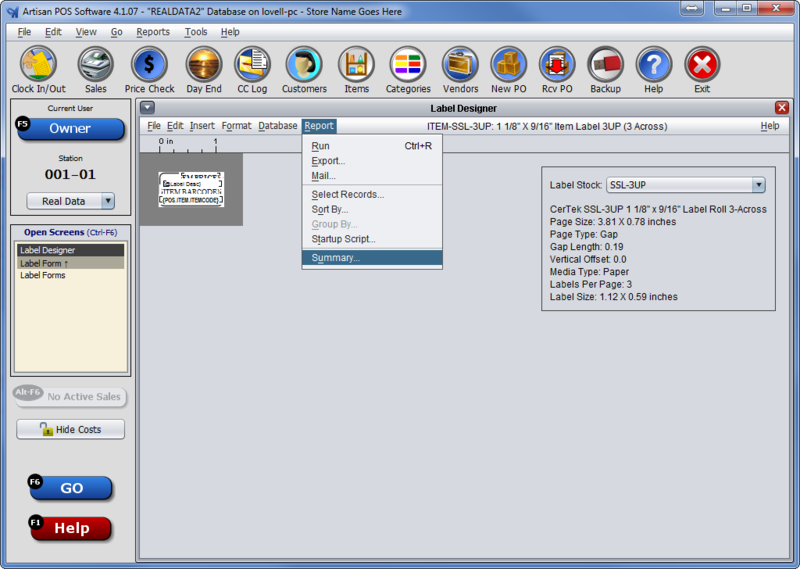 To edit an existing layout, select “Labels” from the main menu, then “Label Designer”. 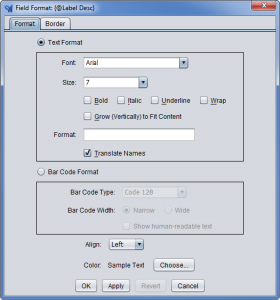 Highlight the label form you want to copy or clone. In order to save the form, you must give it a new name. Edit the Report Name and Report Title as you see fit, it just has to be different than the one you are copying. 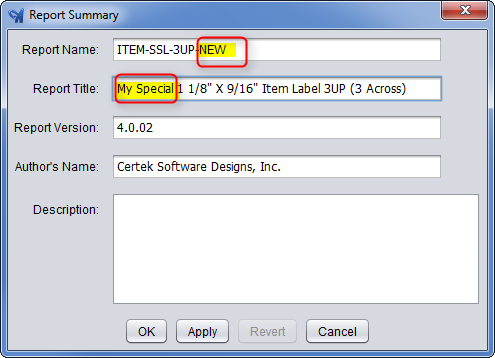 From the Label Designer screen you can edit existing fields are insert new ones. 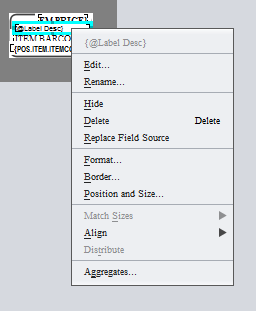 To edit an existing field, select the field you want to change and the border turns turquoise. You can nudge the placement of the field using the arrow keys or you can right click over it to get a menu. 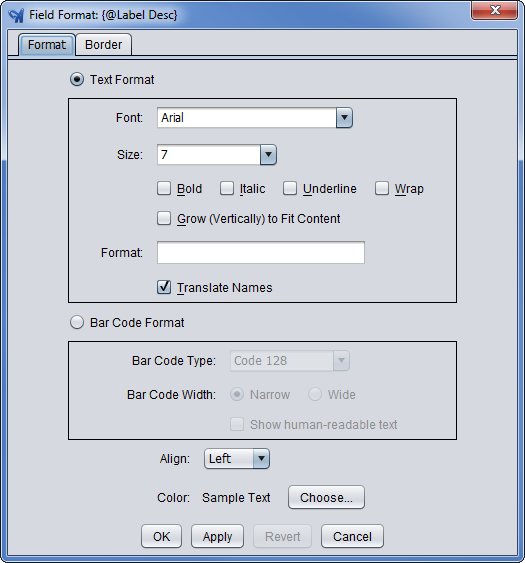 Format… allows you to control the size and other attributes. However, not all fonts will be rendered on the printer as you might expect. 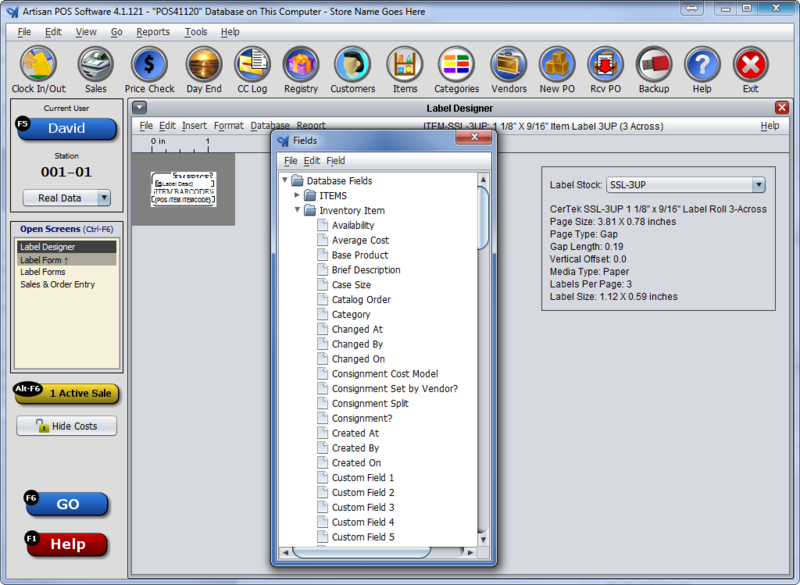 We utilize the internal printer fonts and commands for each printer. 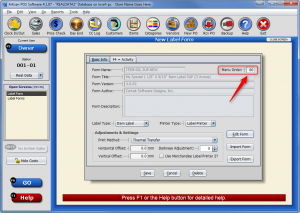 Many fonts are not represented within each printer. It is best to keeps the fonts simple. Practice with the results and make adjustments accordingly. Position and Size… allows you to enter in the exact coordinates for exacting placement. Align will allow you to select multiple object by holding the Ctrl key and then clicking. Then right click over the object that is in the correct position and choose Align. You can then select an edge such as Rights and then all the selected object will align the right edges with the field you did the right click over. 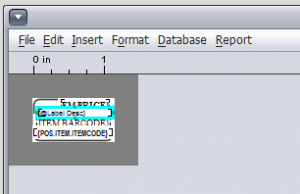 Use the Insert Menu to add a new field. A field can be a database field, a text field, a formula, or a special field with built-in functions. The most common need is to add an additional database field onto the label form. 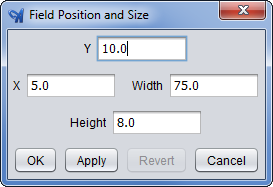 Find the field you want a left click on it and drag it to your label. For now, you should only choose a field from the Inventory Item table until you have obtained an advanced understanding the database structure. Choosing fields from additional tables such as the category table requires an SQL join. If you don’t know what that means, don’t worry, we will be offering advanced label and report designing classes, articles, and videos. Please contact us for assistance. When you are done and ready to test, click on the small right X to close the screen. Since you are working from a copy, if you mess things up you can always repeat the above steps and start over. From here, make sure you enter a non-zero value in the menu order so this label form will be available to you from the label form pull-down menu. From the label menu, make sure you choose your new form! If you don’t see your label here, make sure you have your label printer setup properly. 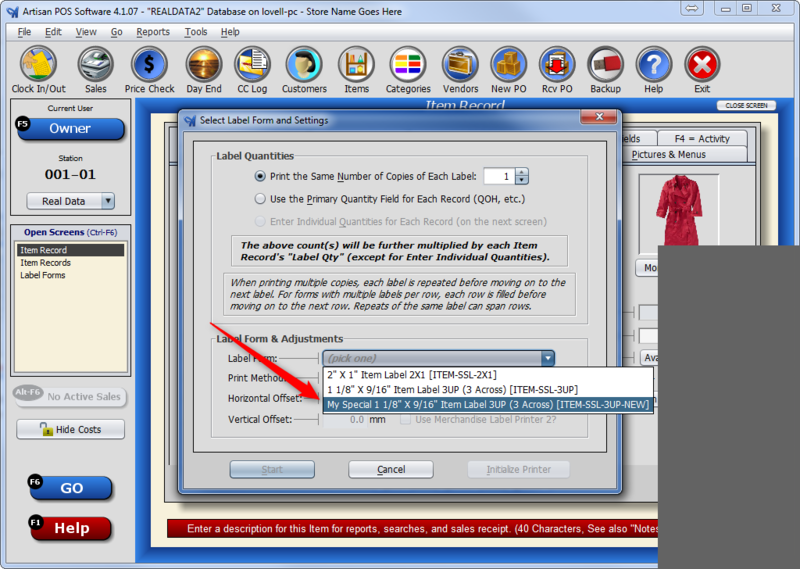 You must have the label printer setup and be the printer specified for merchandise labels, etc. From here, you can edit your form without having to copy it each time. 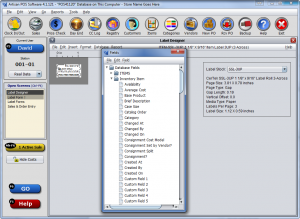 Just double-click it from the label forms list and then choose Edit Form. This is true because this form is not a built in form. Call tech support if you need assistance.